War on waste: A family of four shows us how to combat the problem. This family of four only produces half a bread bag of rubbish a week. How much household rubbish does a family of four, including a baby, produce each week? On a farm in Katanning, about 300 kilometres south-east of Perth, it is an impressive half a bread bag. Ella Maesepp and David Potter had already taken sustainable living to the extremes, building an off-grid eco-house out of a cereal crop. But a year ago, Ms Maesepp decided to try to radically reduce the amount of rubbish they threw away each week. It might seem like a tough task for a couple with a nine-month-old, Quade, and five-year-old, Zavier, but the passionate eco-warrior was determined. “I just had one of those lightbulb moments where I looked at that rubbish bin in my kitchen and just thought, that’s disgusting,” Ms Maesepp said. She calculated the volume of rubbish the family had contributed to landfill each week of the year for decades and was horrified. “It was at that moment I thought no, this is something we have to tackle,” Ms Maesepp said. She said it was a slow but surprisingly simple process of making many small changes that added up to a big reduction of their ecological footprint. “When I said we were going to half a bread bag, I was met with some sceptical looks,” she said. Casting a critical eye over the family’s bin contents was the first step towards slashing how much rubbish ended up in there. 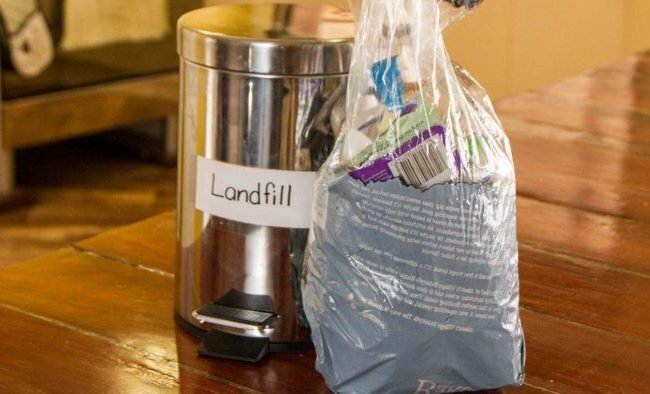 The environmentally conscious couple recycled and composted food scraps, but plenty of plastic packaging was still being thrown away every day. “Like most families, you don’t really think about what you’re putting in the bin,” Ms Maesepp said. Once she understood what they were chucking out, it was “incredibly easy” to break old buying habits and make new ones. Reusable bags are a common sight at supermarket checkouts, but Ms Maesepp also brings her own bags and containers to the fruit and vegetable and deli departments. She buys flour, rice and other dry goods in bulk, and changed brands of cereal and other products to avoid double-packaging. Plastic toothbrushes were replaced with biodegradable bamboo toothbrushes, which they add to the compost or use as kindling in winter. Plastic clothes pegs, brushes and cotton buds were also swapped for wood and bamboo alternatives. Ms Maesepp switched from buying disposable nappies and sanitary products to cloth options. She said single-use disposables such as tissues, baby wipes and straws were big contributors to their total household waste. These days, the family favours handkerchiefs, cloths and stainless steel straws that can be washed and reused. “By eliminating all those things … we didn’t have to change our lifestyle, we just had to change the products we chose,” Ms Maesepp said. Would smaller rubbish bins limit household waste? Ms Maesepp believes every Australian household should minimise their waste to help reduce the impact on the nation’s environment. “Australia is one of the leading producers of waste in the world,” she said. “I think that’s quite embarrassing and … something we need to be ashamed of. Ms Maesepp said the size of a standard Australian household wheelie bin was enormous. “As a society, [we] are saying it’s acceptable for every household to put out 240 litres of waste every single week,” she said. Ms Maesepp hopes to motivate other families to take a closer look at the amount of waste they produce, and follow in her family’s footsteps. “We wanted to show others that hey, we’re just a standard family … living a pretty normal life and we can keep waste down — you can too,” she said.